SPDBS is a Domestic Registry accepted by the American Kennel Club. 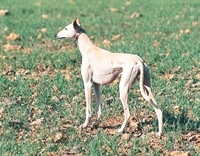 The Desert Bred Saluki Critique Program, which recorded information about Salukis imported from the Middle East and their direct Middle Eastern descendents, was organized during the early 1970s. This became the Society for the Perpetuation of Desert Bred Salukis in 1987. The records of the Society formed a domestic registry, recognized by AKC in 2002, providing SPDBS registered Salukis with a complete three generation pedigree entrance into the AKC studbook.